You may know Tree Brewing from Kelowna but you probably do not know of their second (and new) location the Beer Institute. 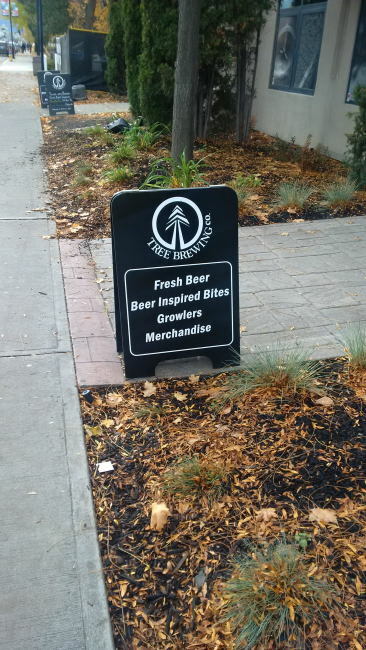 The Beer Institute is located right downtown near Okanagan Lake and Prospera Place where the Kelowna Rockets play. The beer institute has a small brewery that produces all beer consumed on site. They also have a kitchen that make some great food from a great cheese plate that I had to some amazing looking flat breads. When you walk into the Beer Institute you will find a nice tasting room with a bunch of tables and a great bar area. The brewery itself can be viewed from this tasting room. There is also a great patio upstairs that can be enjoyed all year as they enclose it in the winter. On one side of the Beer Institute you will find a small retail space where you can possibly buy a seasonal beer in bombers that was brewed on site. I was able to pick up their Pumpkin IPA. They also sell some shirts and other swag if you are interested all with the Beer Institute branding. Finally Tree Brewing has backed off some on their ban on filling growlers from other breweries. If you come with your own bottle they will fill it with one of their standard beer. They will only fill their seasonal beers if you bring one of their $50 metal gowlers. The growlers are very nice but it is hard for me to justify the $45 extra over a glass growler. Sadly like every other instance with a Tree Brewing location I was not able to have a tour of the actual brewery. This location only does tours during the week. Of course their website does not explain this at all much like their brewery indicates they do tours while almost never doing them. If you would like a tour make sure you either call ahead or email the brewery or you will come out as disappointed as I was again. This entry was posted in Brewery and tagged bc, beer, Beer Institute, craft beer, kelowna, tree brewing. We are hurting for a good craft beer scene in Kelowna so it’s great that this exists. They need more competition though that’s for sure. I still find them to be quite conservative in their styles. I do think they should have built their growler station better. Taps still? Why not those fancy backlit growler stations? When I went in with my Deschutes growler, they couldn’t even fit it under the tap. I had to go to the bar for them to fill it. Plus they wouldn’t let me sample the beer before my fill, I had to go and sit down and buy a glass in order to try it. If you want a good beer culture in Okanagan go for a drive to Penticton. Tree does a good job for Kelowna though and makes safe but good beer. I am totally blown away that they only fill off of taps also! Probably will never get a fill from them until they change this. Looks like a great location and some great beer. I will have to stop by soon! It is a great location and probably super busy before Kelowna Rockets games as it is literally across the street from the arena. If you can contact them in advance to make sure they are doing tours. I never know when I will be available so I just show up. Been skunked every time with Tree. Great pics and info Mike! A California girl, I look forward to getting up to Canada for some awesome brews! Thank you! If you end up coming to Vancouver then make sure to touch base. If I can I will give you a brewery tour. 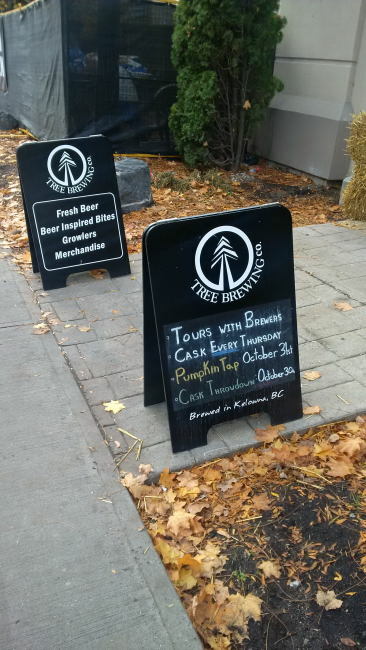 I’ve always been underwhelmed by Tree Brewing, I went to their brewery on my last Kelowna visit and it was OK, but they didn’t have their seasonal beer on tap and were missing some of their 22 oz beers on the sales floor. They are kind of the Granville Island Brewery (the Molson Stuff anyway) of the Interior to me.